Enumeration that indicates an aspect of the look. These flags are used to keep track of which aspects of the look that are overridden from the values provided by the chart palette, using one of the methods in this class. A custom pen is set. A custom brush is set. A custom marker pen is set. A custom marker brush is set. A custom label color is set. This does not copy over the associated chart. This will also changes the marker type to CustomMarker. 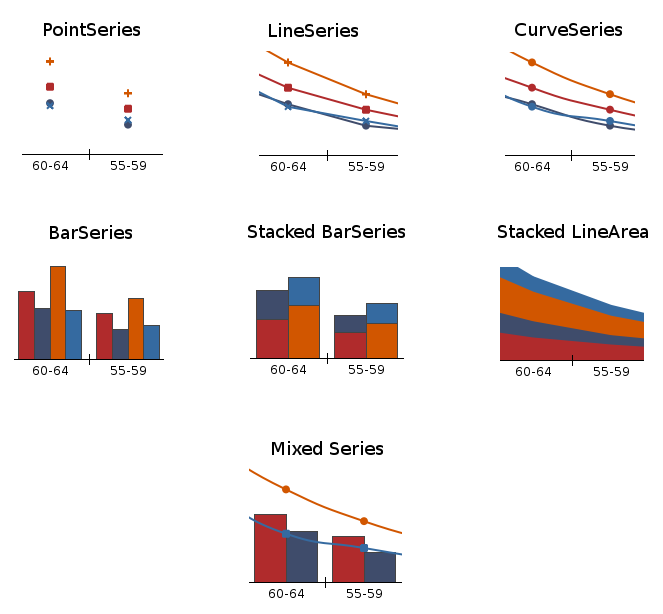 Line or curve series may be filled under or above the curve, using the brush(). This setting specifies the range that is filled. The default value for all but BarSeries is NoFill. Bar series may use MinimumValueFill to configure the chart to render its bars from the data point to the bottom of the chart or MaximumValueFill to render the bars from the data point to the top of the chart. The default value for BarSeries is ZeroValueFill, which render bars from zero to the data value. You may enable labels for the XAxis, YAxis or both axes. The label that is displayed is the corresponding value on that axis. If both labels are enabled then they are combined in a single text using the format: "<x-value>: <y-value>". The default value is a CircleMarker for a PointSeries, or NoMarker otherwise. Individual models per data series are only supported for ScatterPlot type charts.